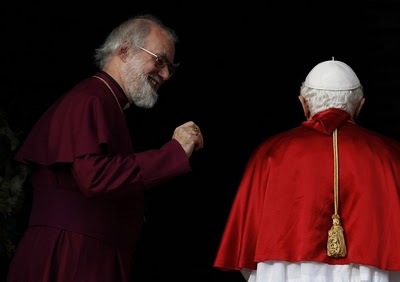 This Friday morning brings significant breaking news on the ecumenical front -- six days after Rowan Williams' latest meeting with B16 (above), Lambeth Palace has announced that the 61 year-old theologian will retire as archbishop of Canterbury at year's end, to become Master of Magdalene College, Cambridge. The first non-Englishman to occupy the chair of St Augustine since the Reformation, Williams leaves the symbolic headship of the world's 70 million Anglicans after a difficult decade-long tenure marked by infighting between his Communion's branches on issues of teaching and identity, headlined by splits over the ordination of women and, in particular, openly-gay clergy into the church's episcopal leadership. A keen student of the Benedictine spiritual tradition who (under the tutelage of a monk) reportedly considered becoming Catholic as a young man, despite the internal hurdles of his turn at the helm, the 104th Archbishop departs his post with Vatican-Lambeth ties quite possibly at their warmest since Pope Paul VI famously took the ring off his finger to give to Archbishop Michael Ramsey at the close of Vatican II. From their first sit-down in November 2006, an ever closer rapport has developed between Williams -- a world-class theologian in his own right -- and Benedict XVI, most recently evidenced by the Pope's inviting the archbishop to deliver a major address at this October's Synod of Bishops dedicated to the pontiff's top pastoral priority, the New Evangelization. While some commentators aimed to interpret Anglicanorum coetibus -- Benedict's 2009 response to requests from Anglican groups to enter Catholic communion as a unit -- as Rome's "parking a tank on the lawn of Lambeth Palace," the Rowan-Benedict bond made for what many Vatican hands considered the emotional high-point of the following year's papal State Visit to Britain as the successors of Peter and Augustine presided together at Evensong in Westminster Abbey (above), marking a Pope's first pilgrimage to London's iconic coronation church, consecrated in 1065 under the patronage of St Peter. In further testimony to the enhanced spirit of goodwill, it was announced earlier this month that the Abbey's choir will make its first appearance at the Vatican later this year, singing alongside the Sistine Choir at an especially conspicuous event: the 29 June Mass for the feast of Saints Peter and Paul, which brings the annual conferral of the pallium on the world's recently-named archbishops. Adding to the timing's significance, the day likewise marks the music-loving Pope's 61st anniversary of his ordination to the priesthood. 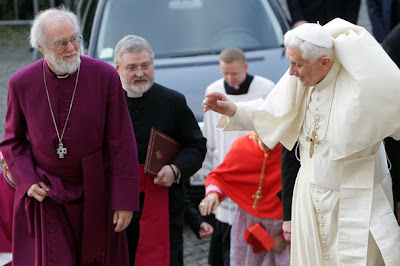 The Anglican primate likely informed the pontiff of his plans last Saturday, as Williams arrived at the Vatican for a day of meetings and prayer with Benedict -- their second in the last six months. The extended schedule now the routine basis for their encounters, it's worth noting that the reigning pontiff hasn't extended a similar treatment to another interfaith leader even once. On his latest Italian trek, the Anglican chief gave a talk on "monastic virtues and ecumenical hopes" at the Benedictine mother-abbey at Montecassino, following a joint Evening Prayer with the Pope (B16 homily) held in the Roman church dedicated to St Gregory the Great, who sent Williams' founding predecessor to conduct the evangelization of England. Coming a full decade before the CofE's customary retirement age of 70 for bishops, today's announcement from Lambeth allows for a smooth transition, giving the Crown Appointments Commission -- the civil body comprised of ordained and lay church leaders -- ample time to recommend the traditional short-list of two nominees to British Prime Minister David Cameron before Williams leaves office. Downing Street's choice must then be formally approved by Queen Elizabeth II in her capacity as Supreme Governor of the Church of England -- a status born, of course, from Henry VIII's break with Rome. 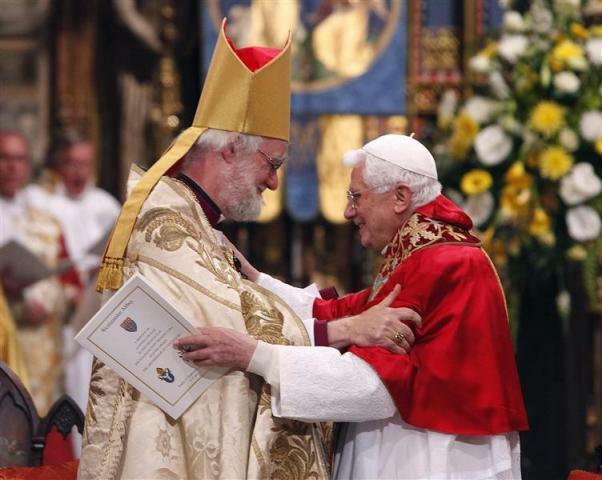 In a statement released quickly after the vacancy became public, England's top Catholic prelate, Archbishop Vincent Nichols of Westminster, said he "will miss" his Anglican counterpart, hailing the departing primate's "kindness, his sharp intellect, his dedication to striving for harmony between peoples, especially within the Christian family, his courage and his friendship."